There appears to be little doubt that trucking Coleman (Battle Creek) Hatchery fall run salmon smolts to San Pablo Bay pens for release during the recent 2013-2015 drought provided near five-fold higher survival (and fishery catch) than releases at the hatchery (Figure 1). Standard late April to early May releases to the Bay net pens resulted in returns of about 1%, as compared 0.1-0.3% for releases at the hatchery. With Coleman Hatchery smolt releases at 10-12 million per year, the difference in release strategy amounts to tens of thousands of adult salmon produced in critical drought years. The problem with Bay releases is it results in considerable straying of returning Coleman hatchery adult salmon to other Central Valley rivers and hatcheries. 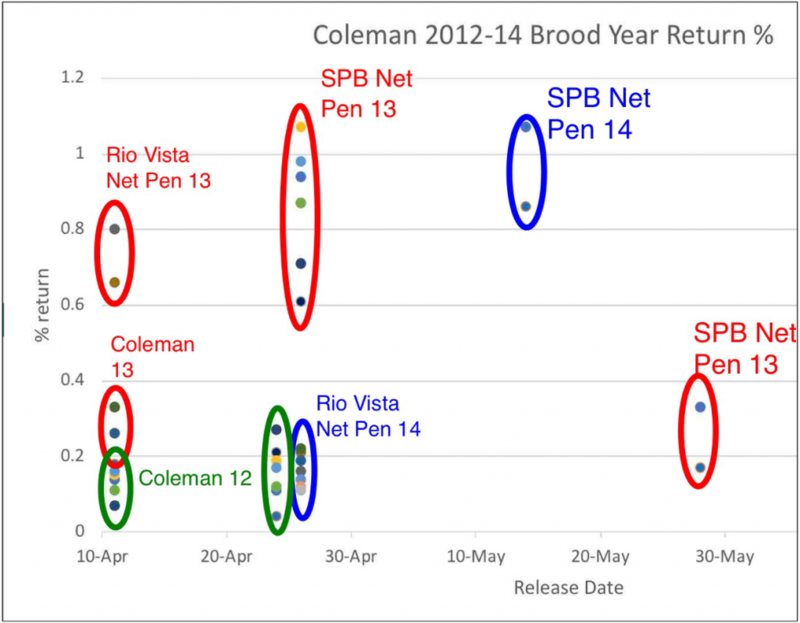 Comparison of returns from several groups of brood year 2013 releases from Coleman and the Bay is shown in Table 1. A four-to-five- fold higher return to the fisheries is evident for the Bay releases, as is a 90% reduction in Coleman Hatchery returns. The return of Coleman fish to other hatcheries is an added problem in that the Coleman fish returned earlier. This was fortunate for Coleman hatchery, because some of the eggs from these fish were shipped to Coleman. It also indicates there may be some environmentally-derived genetic differences in the fall run of Central Valley rivers. Table 1. Comparison of Coleman Hatchery tag recovery numbers from 400,000 smolts released at the hatchery and trucked to the Bay for brood year 2013 fall run salmon. Data source: http://www.rmis.org/. These results beg some real questions. Can the Coleman Hatchery get enough eggs to meet production goals? Is the straying to other rivers and hatcheries a problem or perhaps a benefit? Is the greater return to fisheries from Bay releases worth the effort and problems resulting? Are there other actions that might resolve some of the problems, and perhaps increase survival to the 3-to-5 % level of wetter years? It appears that Coleman was able to raise only 6 million fall-un smolts to release in April-May 2018 (normal release is 12 million) because of the shortage of eggs. These smolts are likely slated for release at the hatchery to minimize future egg shortages. With the irrigation season starting, storm and snowmelt flows declining, and the arrival of warm, dry weather, these hatchery smolts will need a boost to help them get over two hundred miles from Battle Creek near Redding to the Bay and ocean. 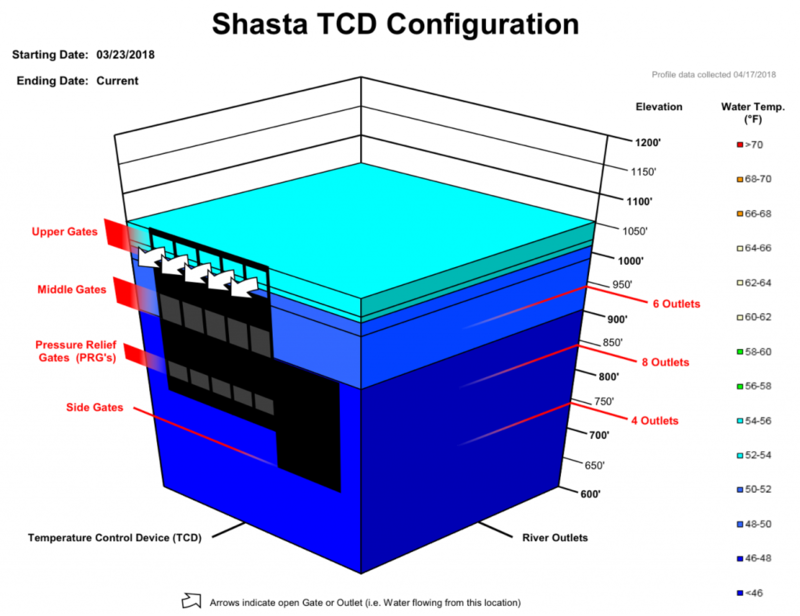 With flows already too low (Figure 2) and water temperatures too high (Figure 3), the young salmon need a pulse of cold Shasta Reservoir water. There is plenty of water in Shasta Reservoir for this. 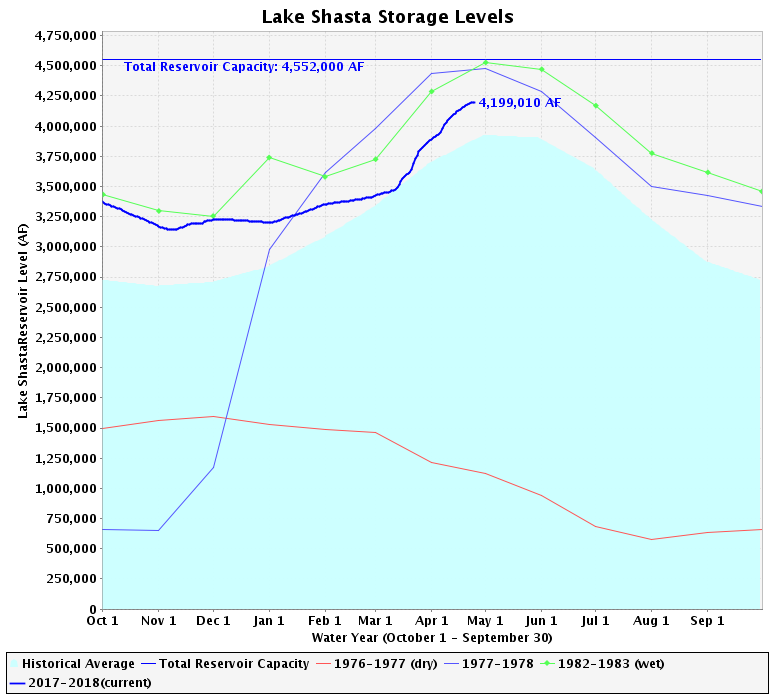 Shasta will fill (4.5 million acre-feet) in a few weeks. It is filling at a rate of more than 10,000 acre-feet per day in mid-April. A pulse of three thousand added cfs to the Sacramento River for ten days amounts to 60,000 acre-feet. The added water should be passed through the Delta to the Bay. I hope this is an element of the plan to recover the Sacramento River fall-run salmon from the 2016-2017 crash. Figure 1. Survival rates (% return) of Coleman Hatchery smolts (brood years 2012-2014) released at various locations in April-May of 2013-2015 drought. “SPB” denotes San Pablo Bay. Data source: http://www.rmis.org/. Figure 2. 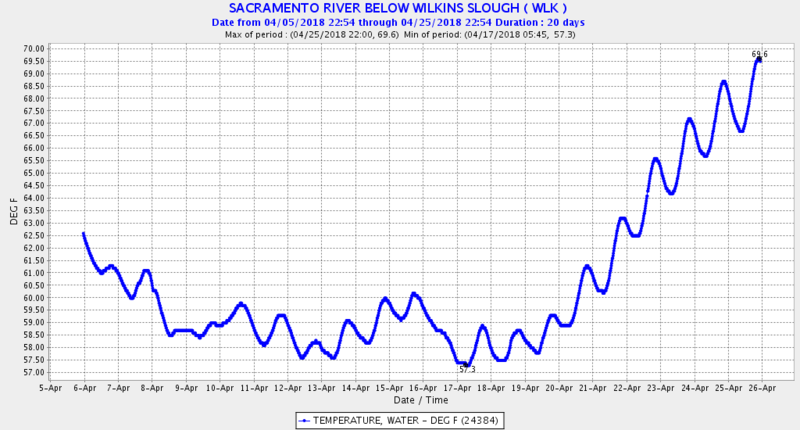 Lower Sacramento River flow at Wilkins Slough (river mile 125), April 12-22, 2018. Flows below 8,000 cfs lead to excessive lower river water temperatures (>65°F). Figure 3. 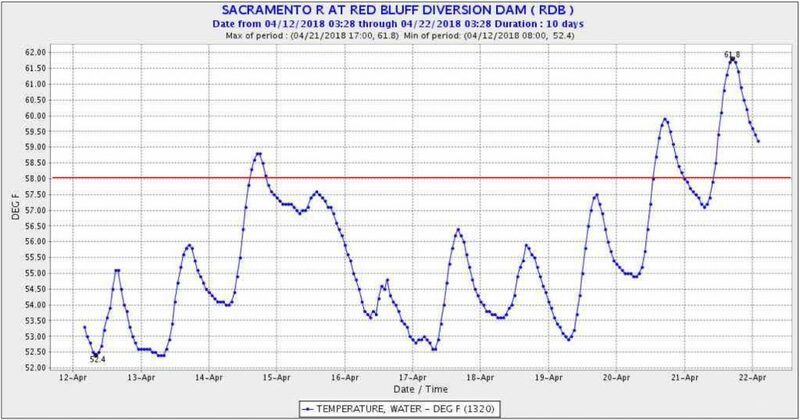 Lower Sacramento River water temperature at Red Bluff, April 12-22, 2018. 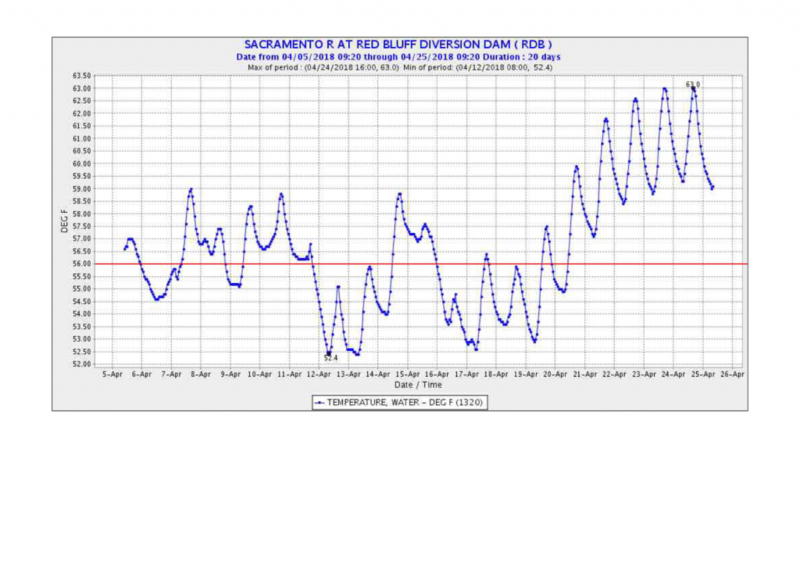 The water temperature maximum-daily-average standard at Red Bluff (river mile 243) is 58°F. 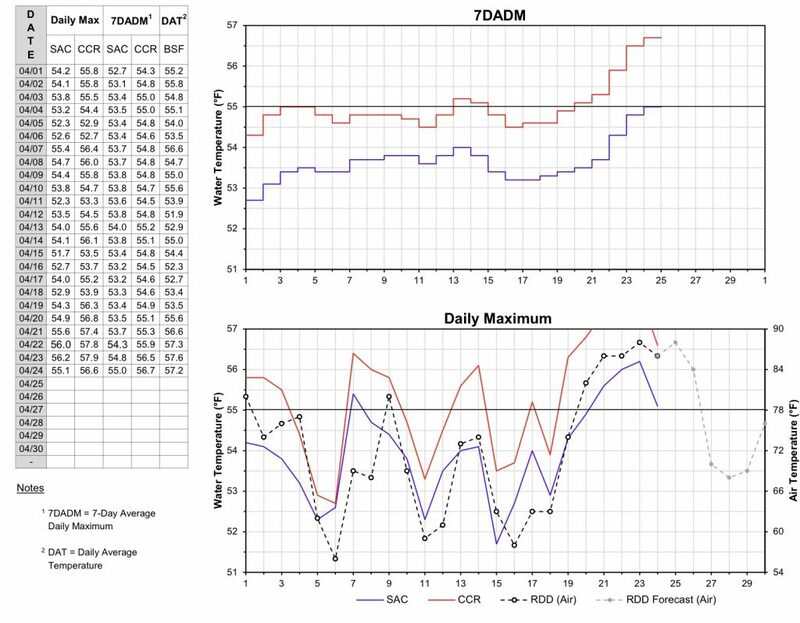 Despite three straight non-drought winters (2016-2018) the Delta smelt spawning run shows no sign of recovery based on the Kodiak Trawl Survey (Figure 1). The February 2018 survey brought a record low catch of only 4 adults (compared to 125-287 from 2011-2013). The March index was “1”. As in my last post, the prognosis for Delta smelt remains grim. 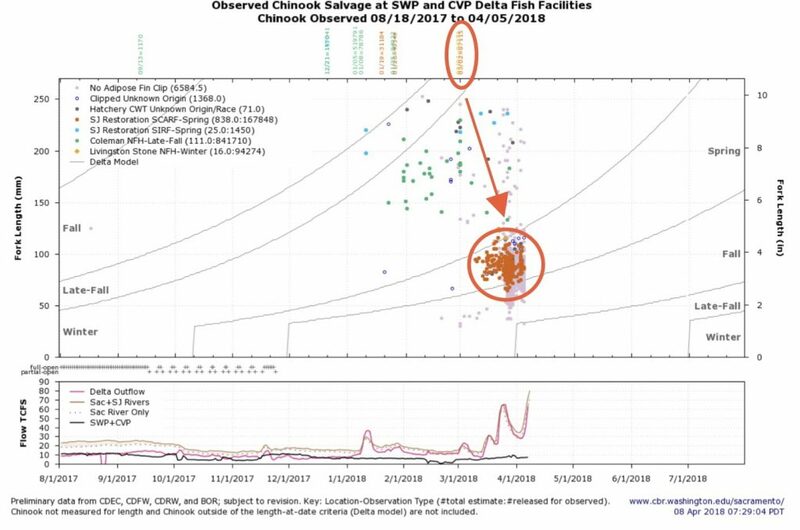 The next check is the spring 20-mm Smelt Survey index to determine if this years spawning run production of juvenile smelt continues the pattern of four years of near record lows (Figure 2). Figure 1. 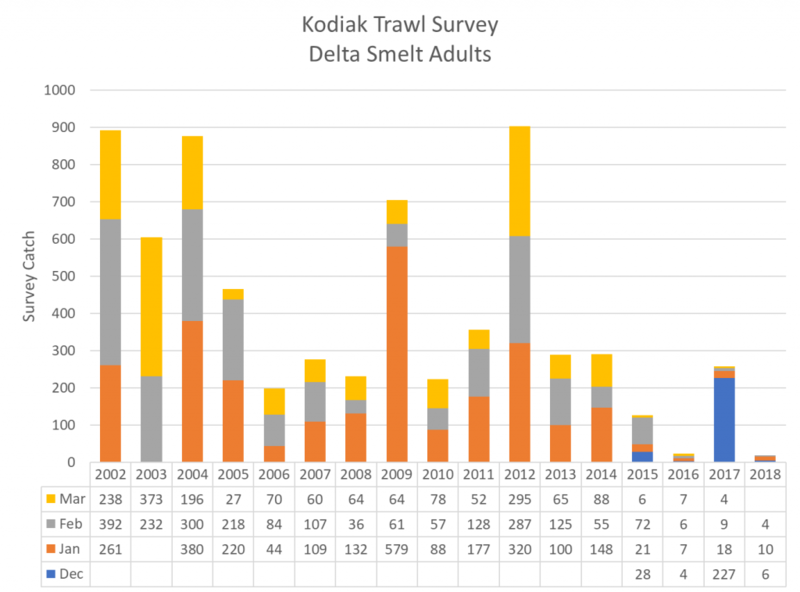 Kodiak Trawl Survey catch of Delta smelt in winter 2002-2018. Source: CDFW survey data. It has been a “Miracle March-April” for water supply and fish in the Central Valley. Over 2 million acre-feet of water was added to Central Valley storage reservoirs. Many major reservoirs reached flood capacity, with large releases and rivers spilling over into flood bypasses. The snowpack doubled to over 50% of average. Water year 2018 cumulative precipitation nearly doubled (remains 10 inches short of average at about 80% of normal).1 Water Year 2018 will likely stack up as “below normal,” not unlike 2010, 2012, or 2016. Without the added precipitation so far this spring, water conditions would be similar to critically dry 2015. The prognosis for salmon, smelt, and sturgeon would be poor with yet another drought year. The fish have yet to recover from the 2012-2016 drought. In the next three months, tens of millions of wild and hatchery juvenile salmon and steelhead will be leaving Valley rivers for the Delta, Bay, and ocean. Millions of young smelt and sturgeon will be trying to reach their Bay low salinity nurseries. Adult fall, winter, and spring run salmon and green and white sturgeon will be seeking their upriver spawning grounds. All of these populations are in real trouble and need help after years of stress. Some of the Miracle March-April water added to Central Valley storage should be set aside for the fish. Fish need higher river flows and Delta outflow through summer than would normally be allocated in a sub-normal water year like this. 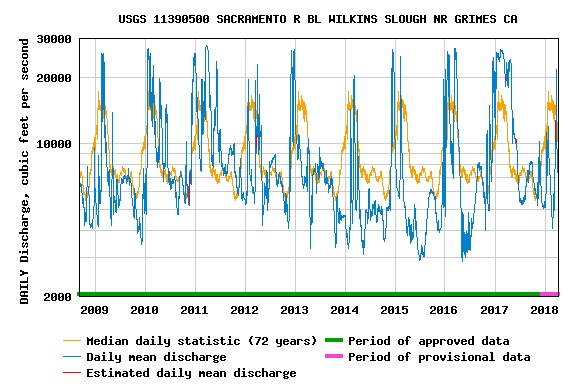 Lower Sacramento River flows (Figure 1) should be kept near 8000 cfs, not the projected 5000-6000 cfs. San Joaquin River flows should be kept near 1000 cfs (Figure 2). The Delta outflow minimum should be 8000 cfs (Figure 3), not 5000 cfs, by allowing the added river flows to pass through the Delta. The “extra” water would amount to about a quarter of Mother Nature’s gift to the reservoir supply added so far this spring. That would seem more than reasonable and fair. In most cases it means meeting already prescribed flow and water temperature standards for the Central Valley rivers and Delta. These standards have been more than regularly ignored in recent years. So let’s do the fish a favor for once – call it “adaptive management” – and see if it helps. Figure 1. 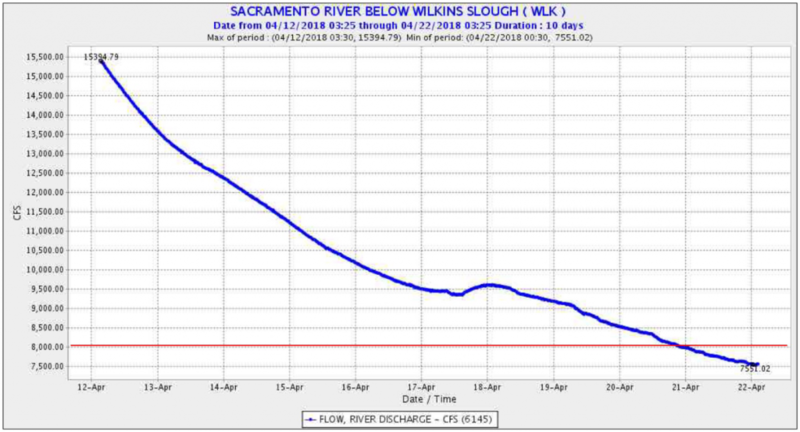 Flow in lower Sacramento River at Wilkins Slough over past decade. Figure 2. 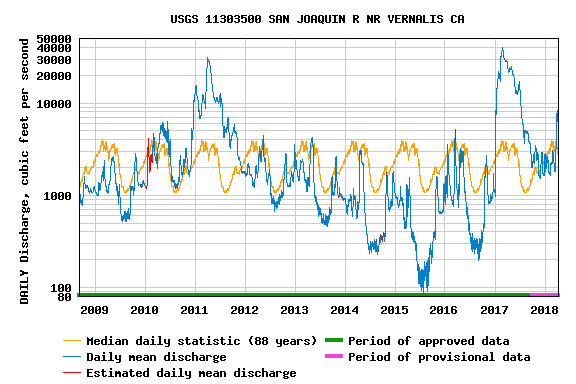 Flow in lower San Joaquin River at Vernalis over past decade. Figure 3. 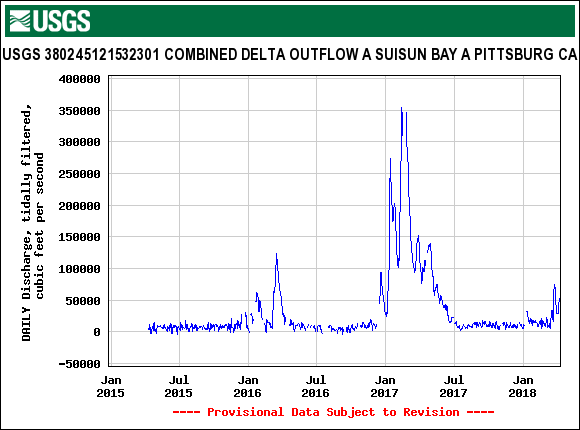 Delta outflow at Pittsburg over past three years. Soon after spring run salmon smolts were released from the new San Joaquin River Spring-Run Recovery hatchery at the beginning of March, they began appearing in south Delta export salvage facilities (Figure 1). The number salvaged is unusually large, about one percent of the 87,000 released1, in salvage historical records as indicated in Figure 1. The salvage rates of recovery for the other winter 2018 Central Valley hatchery releases are much lower. The high rate of salvage of the March 1 San Joaquin River spring-run release reflects the vulnerability of young salmon that are drawn into the south Delta, where they are at risk to the State Water Project (SWP) and Central Valley Project (CVP) export facilities. That risk comes from high export levels in winter-spring. 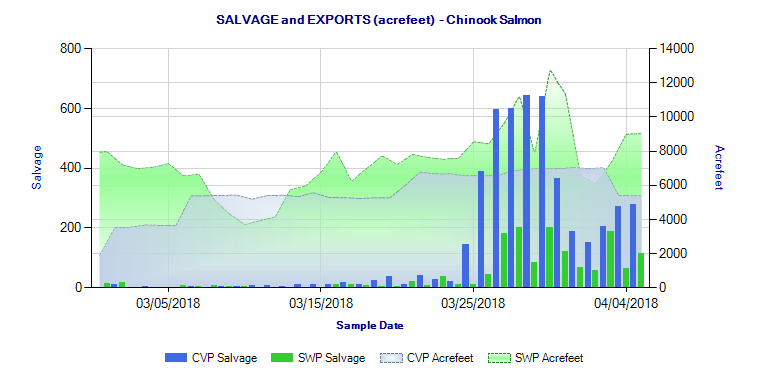 Salvage of the spring-run smolts increased sharply as combined SWP and CVP exports reached high levels (8000-10,000 cfs) in late March (Figure 2). Such high exports were allowed this spring because of the increase in San Joaquin flows in late March (Figure 3). Tying export limits to San Joaquin flows2 and OMR flows is obviously not protecting San Joaquin salmon emigrants. The flow pulse may be the trigger that moves the young salmon down to the Delta. Exports should be reduced, not increased, during such pulses. But both current requirements as prescribed in the OCAP Biological Opinion for the Delta operations and requirements proposed under WaterFix allow increasing exports as flows increase. Figure 1. Salvage of salmon at south Delta export fish facilities August 8, 2017 to April 5, 2018. Figure 2. Salmon salvage and export rates from state and federal export facilities in south Delta March 1, 2018 to April 5, 2018. Figure 3. 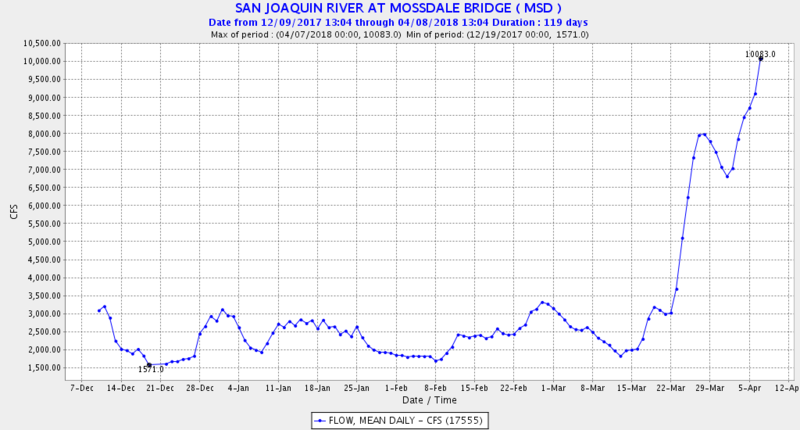 San Joaquin River flow at Mossdale December 10, 2017 to April 7, 2018.